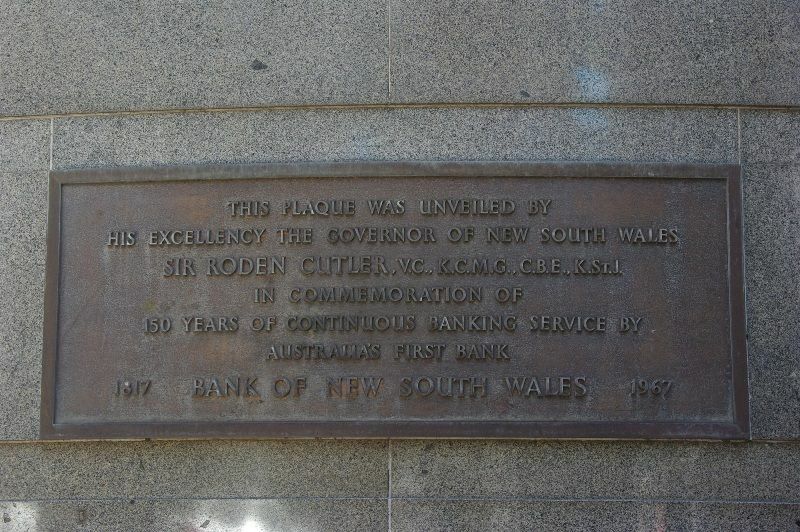 A plaque commemorates the 150th anniversary of the Bank of New South Wales which is now known as Westpac. The bank was founded at this site in 1817. 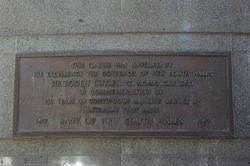 Aware of the need to have a stable financial institution to underpin the emerging economy, in February 1817 Governor Macquarie signed a charter of incorporation which establish the Bank of New South Wales. This was Australia's first financial institution – and it still operates today, although with a changed name. 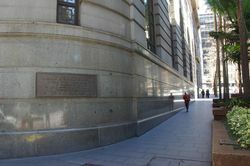 It leased premises in Macquarie Place Sydney, from Mary Reibey an ex-convict turned businesswoman, and opened for business on 8 April 1817. By 1822 the bank had moved to more salubrious premises in George Street.